We're getting to the time of year where we can look out in the distance in the weather computer models and see if there are any "interesting" storms taking shape. I'm a big fan of winter storms. Snow, ice, and thunderstorms. I like watching them all in the winter. This is one of the reasons I like looking out over the next 240-386 hours. The European forecast agency's computer model has picked up on a "wrinkle". It is out around the December 7 through December 9 time frame. Before I go any further, I need a disclaimer. This is not my nor the Heartland StormTeam's forecast. This is just a look at what computer models are showing at a given point in the future. The following information should not definitive. This is merely for discussion purposes only. 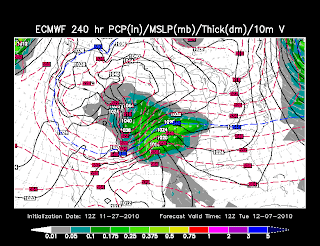 First, let's take a look at what the model was showing from yesterday morning's 12z run. The above map is depicting mean sea level pressure, precipitation, and 500mb thicknesses for 6am Tuesday, December 7. It develops a surface low over southern Texas with an overrunning rain event. Cold air is coming in from north and interacting with the rain. What do you get? Snow. 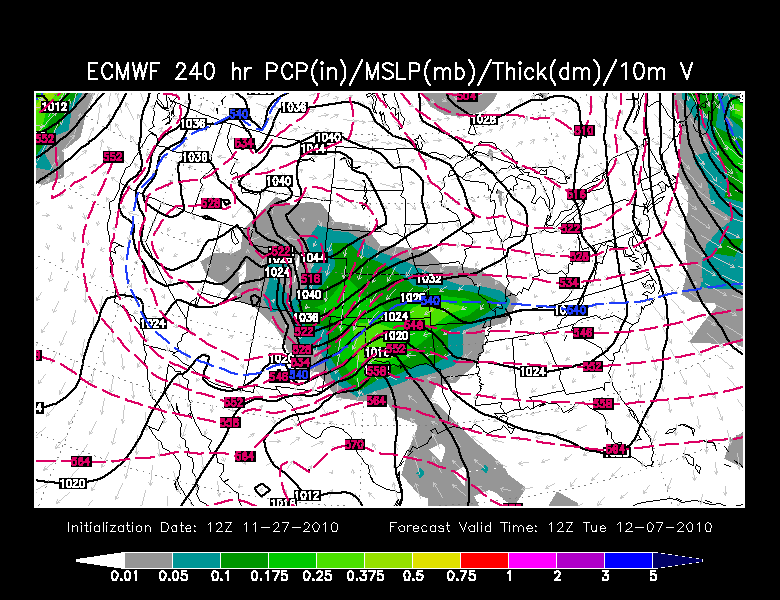 This would be a pretty good snow storm for eastern Colorado, western Kansas, and the Texas panhandle. 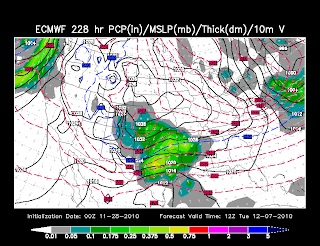 I think there could also be some ice with this storm, perhaps over Oklahoma. Now let's take a look at what last night's run of the model (0z). This is looking at the same time frame, 6am Tuesday, December 7. This run of the model still has some of the same looks, but there are the trends are slightly different. The surface low is a bit further south. The cold air is much further south (around 150 miles). This would still be a snow storm for the Texas panhandle, but also includes Oklahoma and southern Kansas. The big question is how does this storm translate beyond this time frame? Does it move east? Does it move southeast? Does it move northeast? If it moves east or northeast, things could get really interesting around the KFVS viewing area (southeast Missouri, southern Illinois, western Kentucky, northwest Tennessee, and northeast Arkansas). What do I mean by "interesting"? Snow, sleet, ice, and rain? All of the above. What would you like to see out of this storm? This is still a long way out and the storm hasn't even developed. There is a chance that this could be nothing at all. The storm could never develop. But there is also a chance this could be something. We'll just have to wait and see how things develop in real life versus the virtual life of computer models.